We’re currently in Texas and getting ready to leave lovely San Antonio for Texas A&M in College Station. Catching up on our screening recaps, we’d like to tell you about the great screening we had at Simon Fraser University last week in Vancouver, British Columbia. As you can see in the photo to the right, we had a huge turnout. 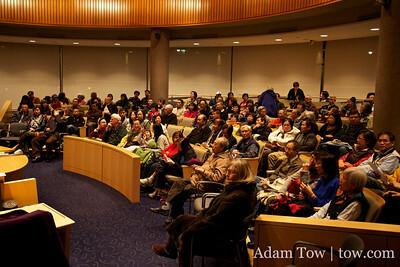 Originally, our screening was to be held in a different auditorium, but SFU received so many RSVPs that they had to move the location to the Woodward’s building in downtown Vancouver. 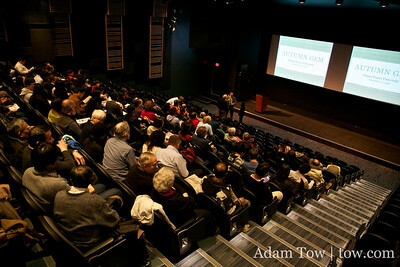 The venue was recently opened or renovated, so our film was among the first to use the new space. Before the screening, we walked around the Vancouver Chinatown, which reminded us of the one in San Francisco. We went to the Dr. Sun Yat-sen Public Park, which would have worked great as a filming location for Autumn Gem! Rae and I also tried to look for buildings that were featured in some of our favorite TV shows, including Battlestar Galactica, MacGyver and The X-Files. Vancouver has a bustling film industry, and there are many filming locations scattered throughout the city and surrounding area.